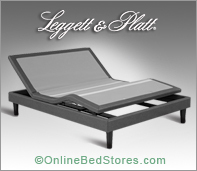 Leggett & Platt Adjustable Beds, L&P is one of the largest adjustable bed manufacturers in the world. Manufacturing adjustable beds for over 30 years, they are a 125 year old Fortune 500 company. 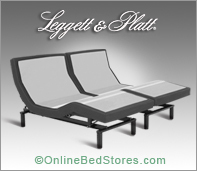 Leggett & Platt adjustable beds are assembled in the U.S.A. All Leggett & Plat adjustable beds undergo extensive testing to insure the strongest and most durable adjustable bed base available. All the electrical components are UL listed. L&P offers a lifetime limited warranty on all adjustable bases. One of the best warranties in the Industry, with over 600 service technicians throughout North America. Some of their new 2017 model Adjustable bed bases include the S-CAPE + 2.0 Models that come equipped with Wallhugger® engineering, wireless stand-up remote and Under-bed lighting. Performance Models – Performance Models S-Cape 2.0 Furniture Style, S-Cape+ 2.0 Foundation Style, S-Cape 2.0 Foundation Style, Simplicity 3.0, Falcon 2.0+, Raven, Pro-Motion 2.0, Bas-X 2.0, Sunrise. 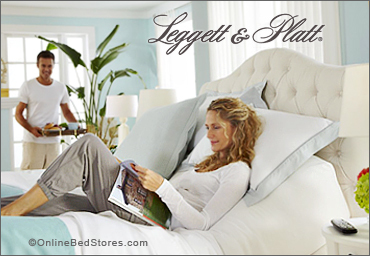 You can find Leggett & Platt adjustable bed bases in retail furniture stores, department stores, and bedding stores across the country, as well as online. When shopping online, OBS recommends only shopping authorized retailers that are available by phone to answer your questions, stay clear of large online marketplaces, many of these “commodity sellers” lack product knowledge, may have incorrect listings and may not be authorized by Leggett & Platt. Remember the lowest price may end up costing you the most. Wallhugger® Engineering, Looks like Furniture, Full-Body Massage, Snore Feature. Wallhugger® Engineering, Body Massage, One-Touch “Flat” Button, Snore Feature, Sleep Timer.